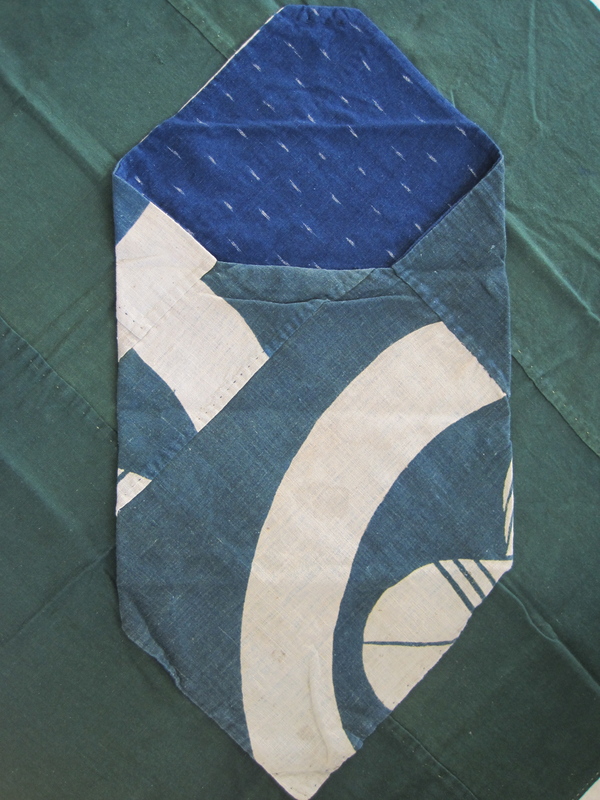 This small tsunobukuro or “horn bag” has been made from leftover fabrics. 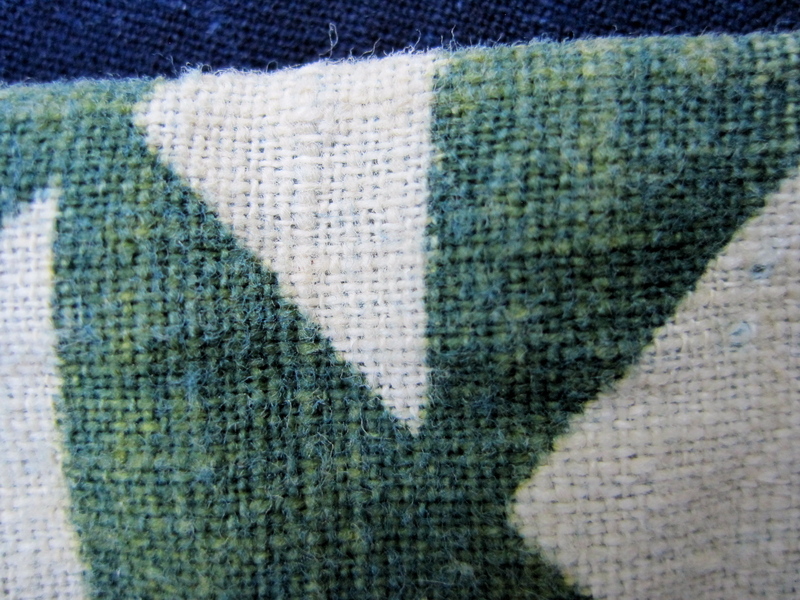 The outer over dyed indigo green fabric once displayed a family crest of crossed feathers. 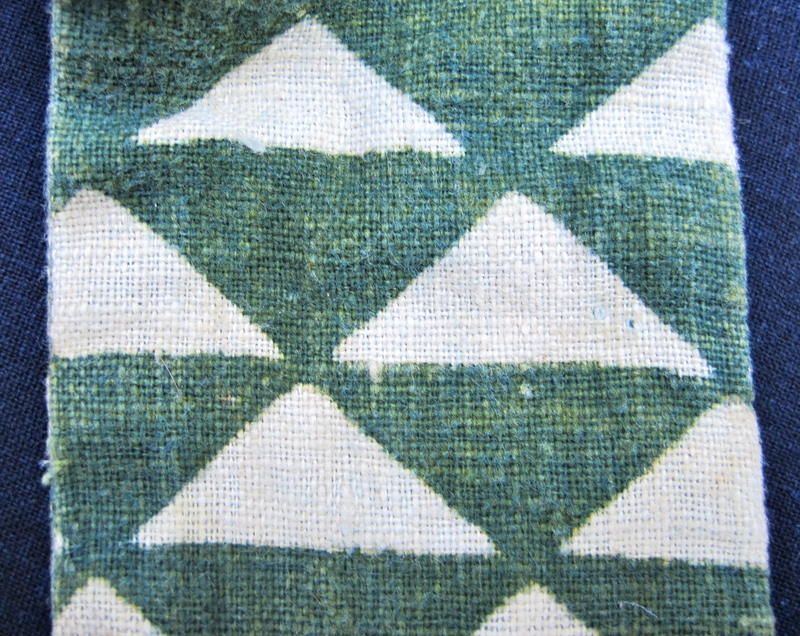 It was dyed using a process called tsutsugaki. 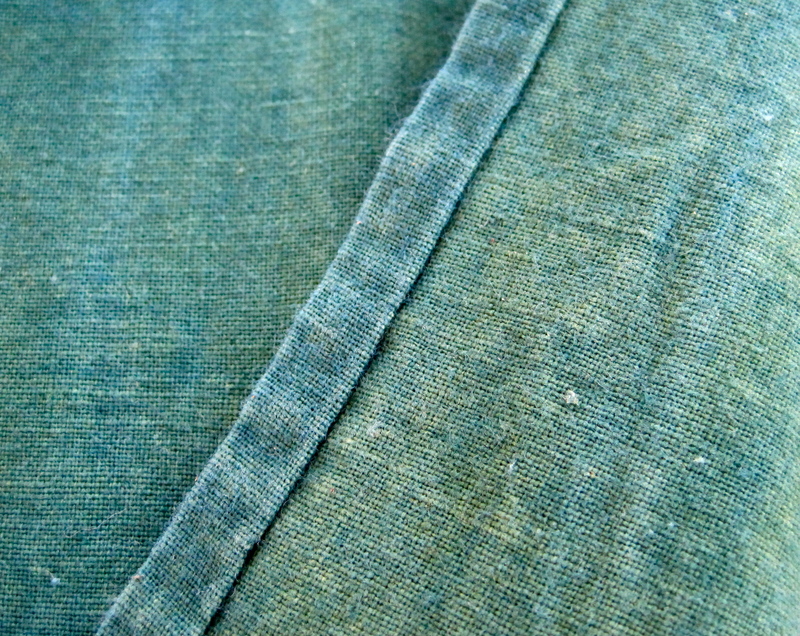 The green color was achieved by being dyed with indigo first and then being over dyed with a yellow dye to create the beautiful blue green background color. 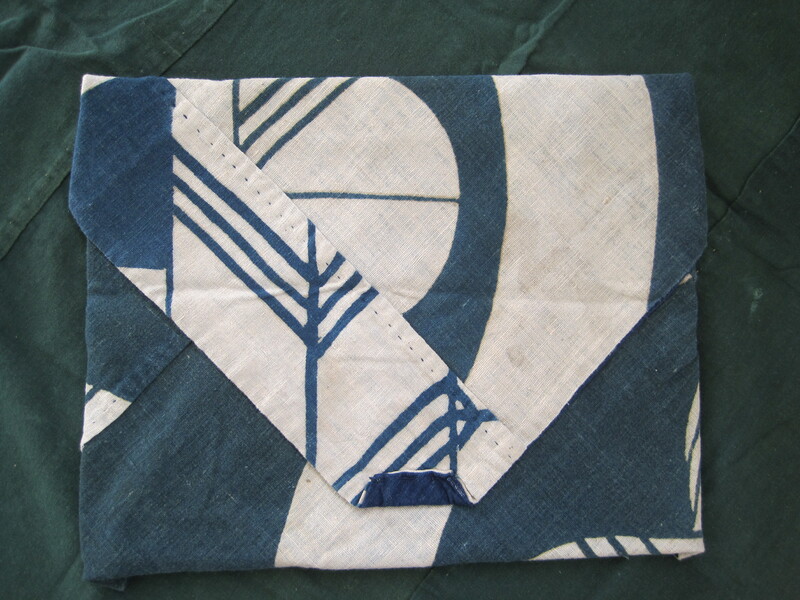 The inner fabric is a beautiful deep indigo kusari or “ikat”. 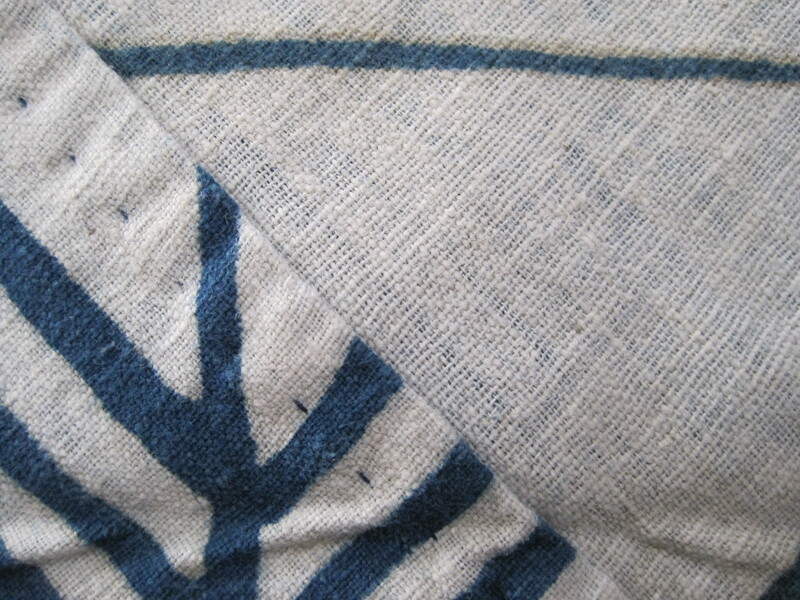 Both fabrics are hand spun and hand woven cotton. 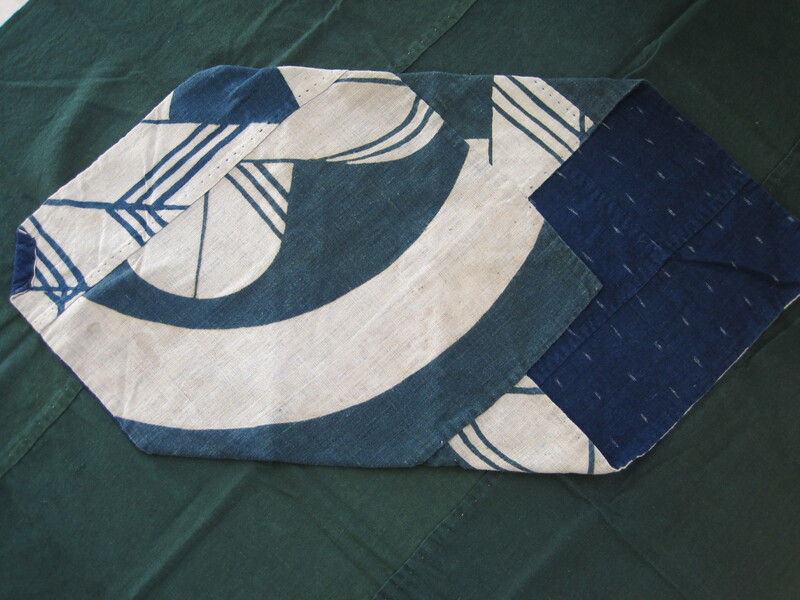 The outer fabric was more than likely a furoshiki or banner before it was reworked into this bag. 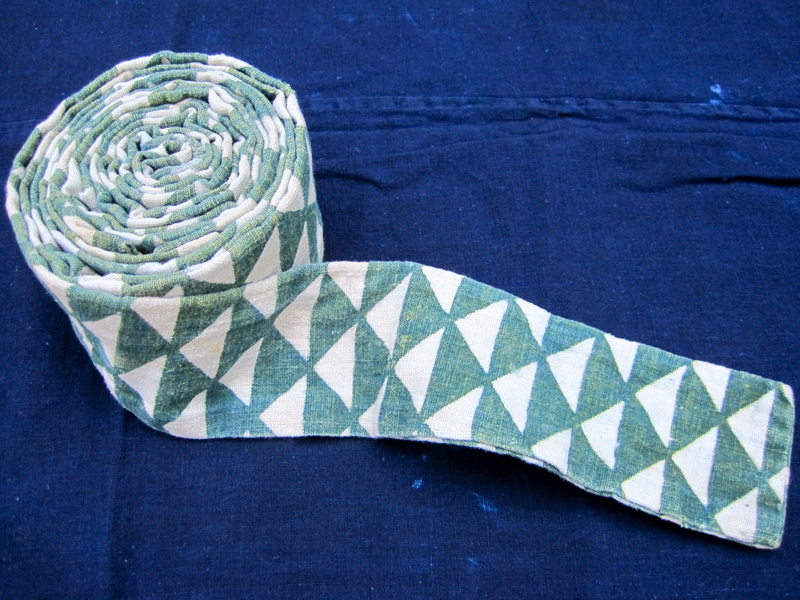 This green hand spun and hand woven furoshiki or carrying cloth was dyed with indigo and then over dyed with a yellow dye to produce a deep green color. 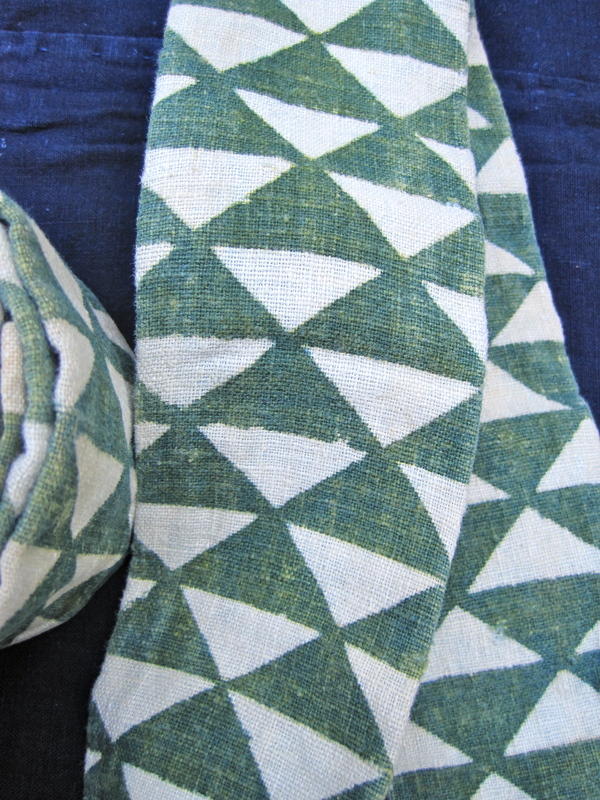 Time and use have given this furoshiki a beautiful gradation of colors and a random ware pattern. 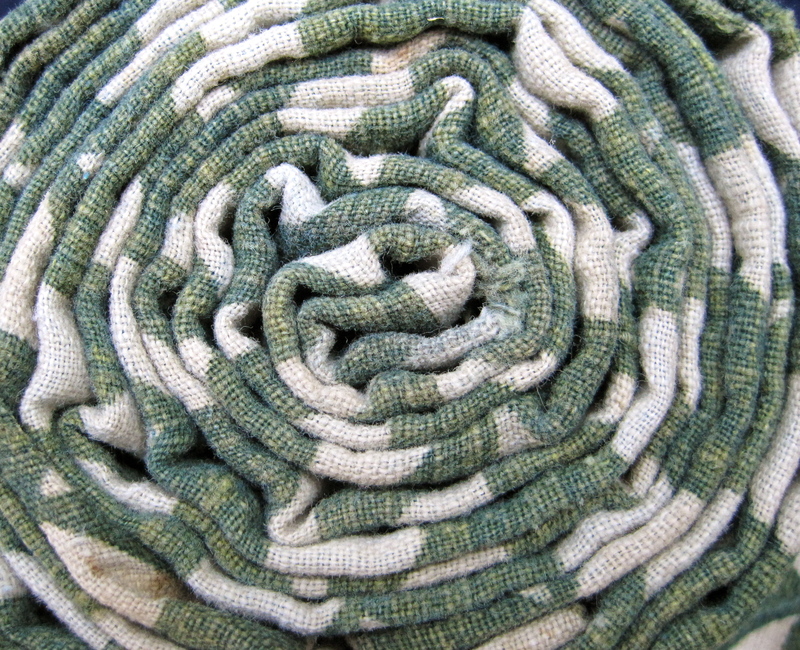 The hand spun cotton has a rustic feel. 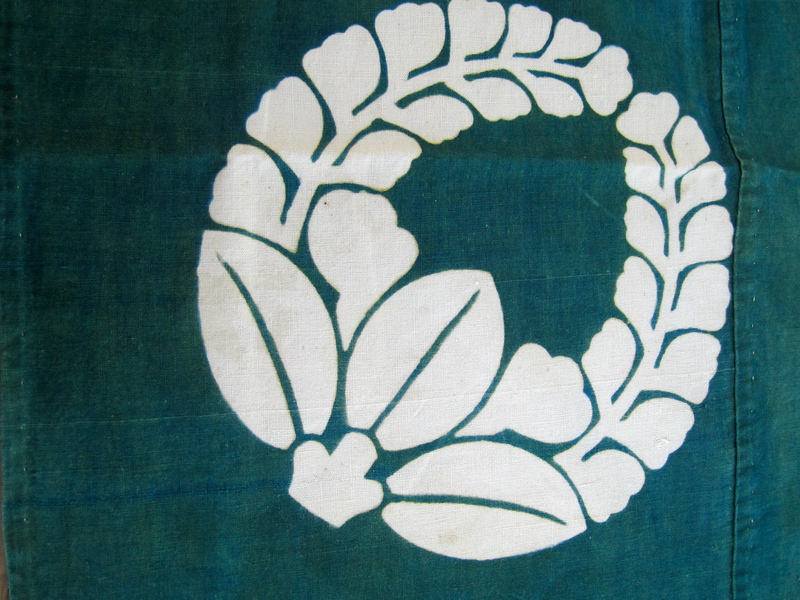 A wisteria kamon or crest has been applied to the furoshiki using a stencil. 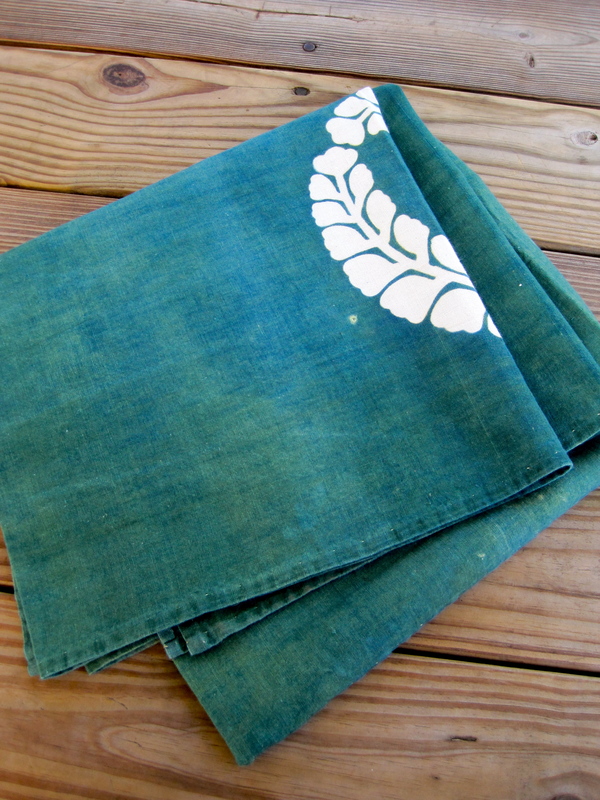 Rice paste was pushed through a stencil and allowed to dry before the fabric was dyed. After dying was completed the rice paste was washed off to reveal the design. This piece probably dates to the first half of the 20th century.